All living beings pass into the Cosmic Force, the great mystery that brings about miraculous births and sudden awakenings in its attempt to maintain balance. While the nature of “balance” is an unanswered philosophical question within the story, we can infer a few things. The dark side is seductive, and those strong in the Force are easily corrupted by it. The destruction and suffering this causes, together with a disharmonious tendency towards authoritarianism, seems to bring about the most common “imbalance”, “shrouding” the Force as happens in the prequel trilogy. We can only speculate as to what an imbalance caused by “too much light”, would look like, since the light side is by nature less aggressive. Those on the light who act aggressively, such as the Clone Wars era Jedi, end up doing the dark side’s work. This is supported on Mortis: the conflict between Obi-Wan, Anakin and Ahsoka feeds the Son’s power, while the Daughter’s attempts to defeat him using the Dagger only strengthen him and lead to her death. On Mortis, the dark side is associated with death and destruction, and the light with life and creation. Perhaps, without the dark side, the Living Force could not complete its cycle of fueling the Cosmic Force: “Death and decay, which feeds new life”, Rey sees as she meditates in The Last Jedi. Using the dark side, though, is the path to suffering – your own, and that of others. The Jedi prioritize maintaining balance (“even if people get hurt”, Luke tells Rey in a deleted scene), while darksiders seek power for their own ends. The Jedi are not crusaders out to destroy the dark side itself: they value harmony, which on occasion means confronting the growth of the Sith, or other darksiders. And it is the Jedi who reach a level of harmony with the Force that no darksider could ever achieve: joining their consciousness to it. There are two fundamental ideas here: letting go of our emotions, and also the desire to control and manipulate the natural course of life. Instead, we must be at peace, passive, surrender to the will of the Force and become a vessel for it. It is no accident that it is Qui-Gon, who devotes his life to “the will of the Force”, who discovers the deep connection that leads to eternal life. Conversely, it is Anakin’s reluctance to let the Force take its natural course that turns him to the dark side: the promise that he can manipulate life and death, so he doesn’t have to accept it. One of Rian Johnson’s subversions in TLJ is that it is Kylo Ren who tells Rey to “let go”: usually good advice in Star Wars. Kylo’s form of “letting go”, though, is a violent, emotional act of killing the past; aggressive rather than passive, and hypocritical, because he can’t let go of either his hatred or his power. Johnson’s use of “let go” cleverly contributes to Rey’s, and the audience’s, disorientation in this moment. The final challenge set for Yoda by the Priestesses is a vision of himself and Anakin confronting the Sith. 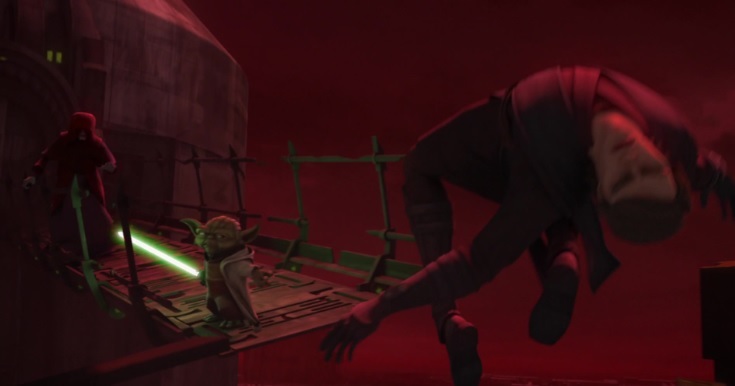 On a crumbling bridge high above Coruscant, Yoda faces a choice – fight and kill Darth Sidious, or sacrifice himself to prevent Anakin from falling into the abyss. Yoda chooses the latter, and this selfless act convinces the Priestesses to hand Yoda back to Qui-Gon for his Force ghost training. Selflessness is the heart of the Force ghost idea, as revealed in the original RotS screenplay and Matthew Stover’s novelization. Eternal life is, Qui-Gon explains, “the ultimate goal of the Sith, yet they can never achieve it; it comes only by the release of self, not the exaltation of self. It comes through compassion, not greed.” In the screenplay, he goes further: “You will learn to let go of everything. No attachment, no thought of self. No physical self.” The ability to maintain consciousness requires, paradoxically, surrendering your physical identity, and your attachment to the world – letting go, and becoming part of something greater. Acceptance that passing into the Cosmic Force is a natural part of life is essential to the Jedi journey. To resist it, to cling on and refuse to accept loss, is the path to suffering. In Rebels, Kanan teaches Ezra that “The Jedi teach that life doesn’t cease at death, but merely changes form in the Force. Your parents are alive inside you, Ezra. 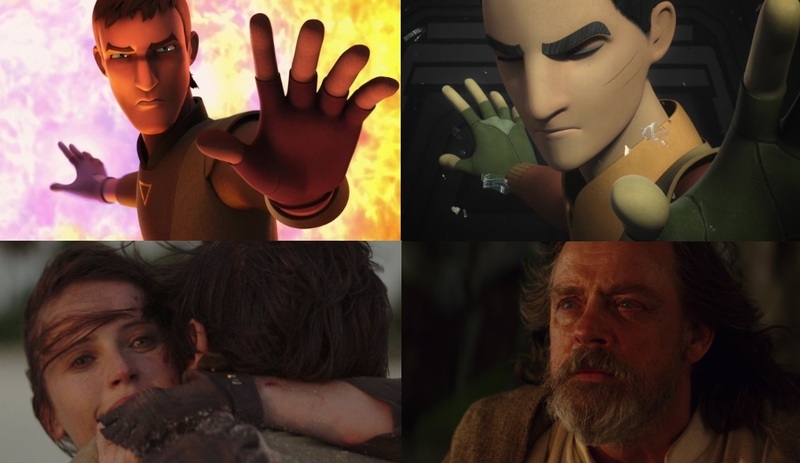 They will be, always.” The culmination of Ezra’s journey is resisting firstly the temptation to save Kanan in the World Between Worlds (“I’m asking you to let go”, says Ahsoka), and secondly Palpatine’s promise that he can bring back his parents (“You’ll always be part of me,” Ezra echoes Kanan, “but I have to let you go.”) “That is the way of things”, Yoda tells Luke on his deathbed. “The way of the Force”. The opposite instinct, to cling to the physical world and control it, is the heart of the Sith search for immortality. Darth Plagueis attempts it by using the Force to manipulate midi-chlorians, alter natural biological processes and resist the passage of time. Bending the Force to your own ends is a hallmark of the dark side – even when constructing a lightsaber, Jedi seek harmony with a kyber crystal, while darksiders manipulate it to their will, making it bleed red. On Moraband, Yoda is taunted by the echoes of ancient Sith Lords who assert “there is no life after death.” When Obi-Wan tells Vader “I shall become more powerful than you can possibly imagine”, he means it literally: a darksider could not conceive of letting go, surrendering the physical world with all its power and pleasure, and becoming part of something greater. When Qui-Gon talks of achieving eternal life via compassion, we remember Anakin’s definition of “unconditional love” in Attack of the Clones. Sadly, he doesn’t live up to his own words. Compassion means putting the needs of others above yourself, but Anakin consistently prioritizes his own feelings. He doesn’t love Padmé as much as he loves the pleasure she brings him: “nothing is more important than the way I feel about you”, he tells her in The Clone Wars – not “nothing is more important than you”. His love for Luke is different. In sacrificing himself for his son, he places Luke’s needs above his own, and lets go of his power and his hatred, and the life he has clung to. The Daughter of Mortis makes it clear: the light side is always selfless, and the dark side is always selfish. This is how the Force ghost mystery takes us to the heart of Star Wars: the selfless choice or the selfish, letting go and finding enlightenment or clinging on and causing suffering. Future filmmakers may be tempted to introduce a form of “dark side” immortality, but should resist the thought, because it would fatally undermine the value system at the heart of a series which was designed to teach these lessons to children.